A home sealed with spray-foam insulation. Q. My wife and I have put down a deposit and are in the preliminary design stages of building a house with a Cape Cod company. The builder is proposing open-cell foam to insulate the walls and underside of the roof of what will be a single-floor house with possibly a small second floor on one side for a third bedroom. A friend of ours who is a builder said that when he constructs his retirement home, he will use tar paper, fiberglass, and loose, blown-in insulation so his home can breathe. The friend also warned us against warm- or hot-air roof systems, saying they are prone to moisture buildup and mold issues. He has even seen black spots on Tyvek wrap when doing renovation work. Also, I saw on an episode of “This Old House” that they used some type of grid/matrix system between the shingles and the sheathing to create airflow. 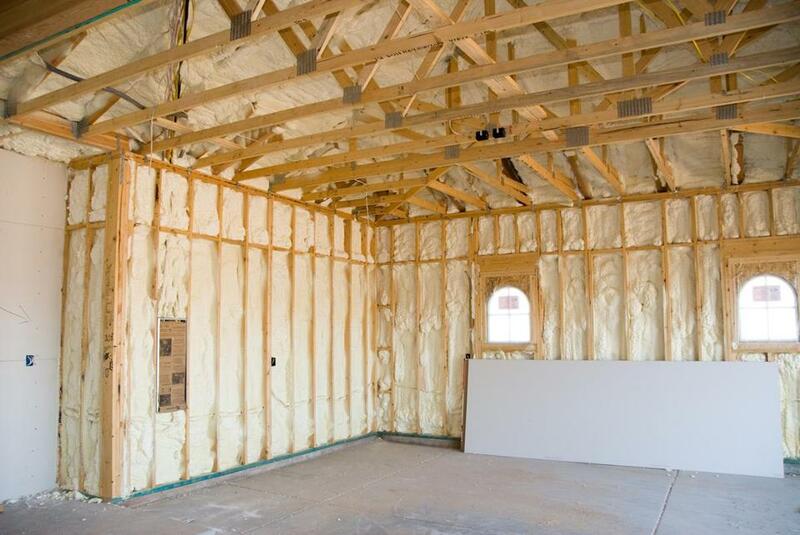 What are your thoughts on the best way to insulate a new home and prevent moisture buildup? A. I have never heard of problems with spray foam, so I reached out to my friend Frank Bood, owner of InsulationDoneRight.com, for advice. According to Frank, moisture can be a concern if you construct a home and insulate it with open-cell spray foam. If closed cell is used, the moisture cannot make its way to the wood and present mold issues. By the way, if you have an undersized bath fan or one that isn’t properly vented, you can have moisture in your home. You may never notice it — it can go out with the heat you lose — but once the home is sealed up with closed-cell spray-foam insulation, the moisture levels will start to rise. It is amazing to me how many homes have bath fans that vent to the attic space instead of outside. As for mold on the Tyvek: This indicates there was trapped moisture outside the building envelope, the physical separator between the interior and exterior of a building. (Components of the envelope are typically the walls, floors, roof, windows and doors.) From what is anyone’s guess: poor shingle ventilation, bad shingle installation, leaky gutters, bad seams at windows or joints? I have to say in my 20-plus years of demo work for remodels and additions, I have not seen mold on Tyvek. Regarding the grid system, I think you are talking about Cedar Breather, which is similar to a rain screen. These rain screens provide an air gap between the siding and the water-resistant barrier (the asphalt felt or house wrap). Rain screen gaps help dry the sheathing, which can accumulate moisture during cold weather. They also help to dry the siding when it is soaked by rain. Q. As the owner of a historic home in Somerville’s Davis Square, I am keen to install a sprinkler system, part of which would be upward-facing spray heads in the attic space to protect against a burn-down-from-the-top scenario. A vendor told me I’ll have to remove the glass-wool insulation covering the ceiling and replace it with spray foam, adhering it to the underside of the roof, which is slate and asphalt. This would allow the attic space to remain warm, keeping the sprinkler pipes from freezing. Mindful of last year’s horror stories of ice dams and water seepage, I’d appreciate your general observations about this proposed plan and advice on what to watch for regarding ice dams or other threats to roof integrity. A. Using closed-cell spray foam on the roof deck ensures the roof will not get warm enough to melt snow and cause refreezing as the water hits colder temperatures along the roofline. Most folks have HVAC equipment in the attic to save space, but this can result in a huge heat loss. Closed-cell spray foam outshines all other insulation, especially for protecting your sprinkler lines, because it seals air leaks; other insulations insulate, of course, but allow air to flow through them. I reached out to Frank again for his advice on slate roofs. He told me that using spray foam insulation usually isn’t a problem if the slate roof is fairly new and doesn’t leak. Rob Robillard is a general contractor, carpenter, editor of AConcordCarpenter.com, and principal of a carpentry and renovation business. Send your questions to homerepair@globe.com or tweet them to @globeaddress or @robertrobillard.